Nomads Not on Every Corner! Bade Saba is going to be held in the world heritage city in Iran: “Yazd”. 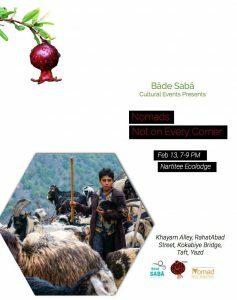 On Feb 13th, we will gather to watch People of the wind documentary in an eco-lodge surrounded by a pomegranate garden 20 minutes far from Yazd city centre. This place is run by a lovely Zoroastrian couple: Ramtin and Tina, who are dedicated to what they do and in love with their local culture. Find out more about “People of the wind” here. Don’t miss the chance to join us for a Nomadic night in nartitee. As the seats are limited, please register your free place in advance.